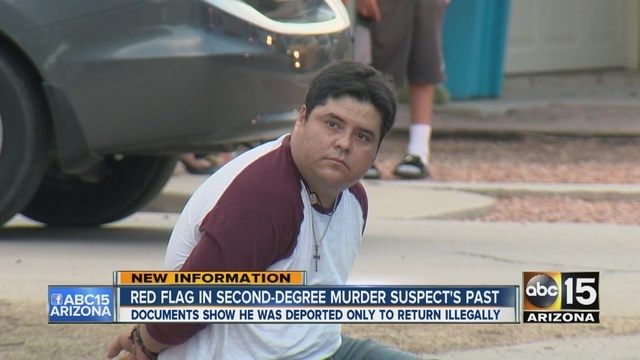 A man from Mexico who was deported in 2009 after his conviction for dealing drugs is being held on a second degree murder charge. Juan Diego Toscano-Delval was fleeing arrest for again dealing drugs when he crashed into a car causing the death of the driver. Juan Diego Toscano-Delval was the subject of a month-long investigation as the suspected head of a drug-dealing gang in Phoenix, according to police, when he was observed making a drug deal last Monday. Toscano-Delval took off from a police officer who tried to pull him over, reported KNXV. The officer did not do a hot pursuit choosing instead to follow at a distance. Toscano-Delval ran a stop sign and T-boned a car driven by Henry Tamayo, fatally injuring him, according to KPNX-TV. KNXV reported police found five pounds of heroin and two ounces of methamphetamine “packaged for sale” in Toscano-Delval’s car after the crash. He was hospitalized with a broken leg. The victim, Henry Tamayo, was from Colombia acccording to his family, said KNXV. “Tamayo was a professional photographer and originally from Colombia where he still has family.